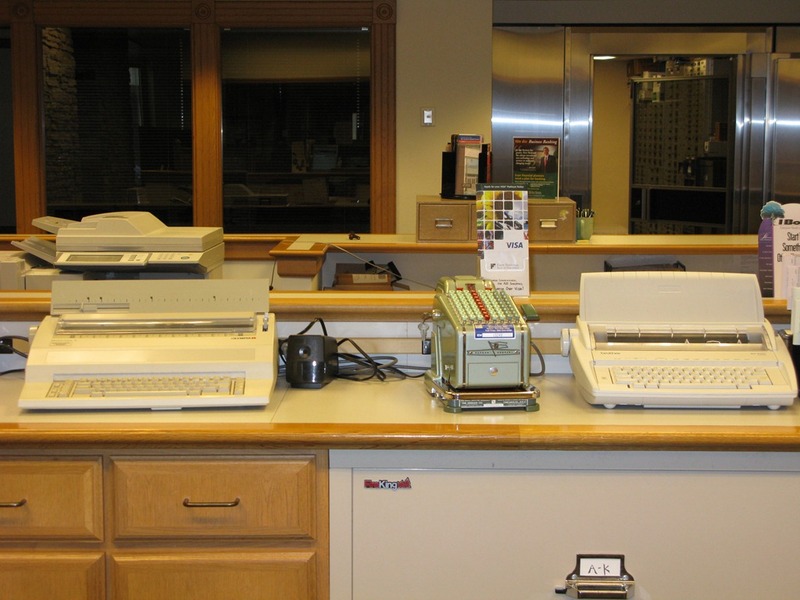 The counters behind the tellers at First National Bank of Northfield contain a number of, um, relics that apparently are still in use. The electric typewriters are obvious but can you name the others? The counters and the safe. I’m thinking I see a postage meter in there as well. Boy those 4×5 file drawers look pretty old…. Index card boxes and filing cabinets. I still have a filing cabinet at home but the only thing I add to it is receipts, primarily for electronic gear. And even paper receipts are going away. The last time I was at the Apple store, they emailed me my receipt. Pens! I use a pen so little these days that my penmanship has regressed to pre-3rd grade level. When I do have to write something, it ends up being this weird hybrid of cursive and printing. Sister Mary Francis would be so ashamed of me. Griff- I’m glad to hear that your world is approaching the paperless nirvana promised many years ago by the computer proponents. My world, unfortunately, is drowning in the reams or reports printed out daily for my perusal. And, since I cannot drag my computer all over the two acres of store in which I work, I go through many pens in a year just writing down products for people. Have any extras lying around drying up that you care to get rid of? I spy! There is a pencil sharpener! Ahhh but it is an electric one! That one never made sense to me. Robbie- No pencil sharpener is pointless! Griff said; When I do have to write something, it ends up being this weird hybrid of cursive and printing. I have been guilty of this forever, but I do it for the look of it. We create as we go. Fax machines are becoming obsolete.